Giant 13cm split pom pom maker. 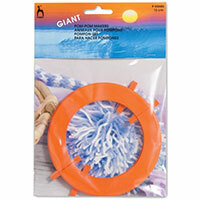 This is a giant 13cm pom-pom maker, there is 2 halves and each half splits in 2 for easy making and removing of pom pom. Instructions included on back of card.